The Sugar High Friday online edible events are always a welcome challenge for A Veggie Venture. But January's mean'n'lean Sugar LOW Friday created a special, um, opportunity. Sure, there're vegetables in cakes and sweets and even sorbets and ice creams (oh! I can't wait to spring one or two cold ones on us all some warm day soon!) and all calling for piles of sugar, buckets of butter. So like every good writer who starts over entirely when a sentence doesn't work, I decided to turn the SHF/SLF thinking upside down by choosing not a sweet, not a dessert, but instead a dessert replacement ... a snack. 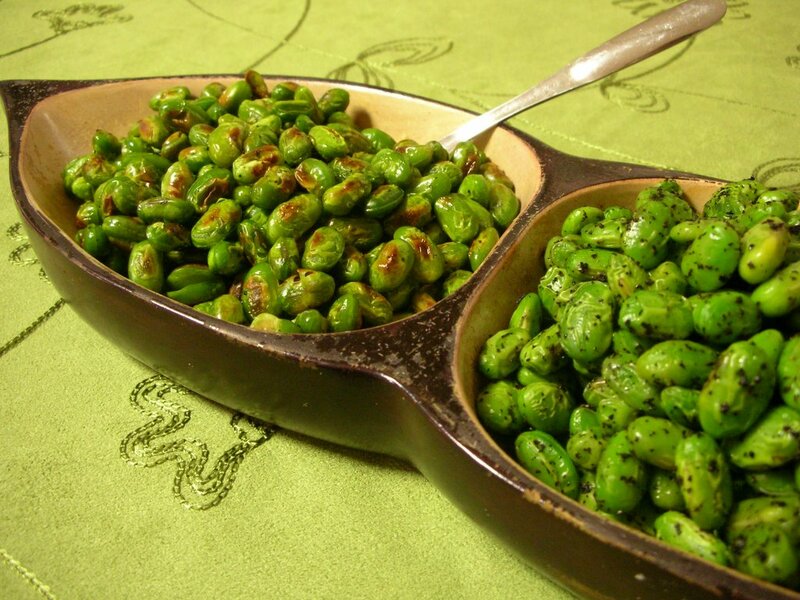 A vegetable snack, of course, made from protein-rich edamame beans. With NO cream. And NO sugar. And only a tiny bit of oil. And quite tasty to snack on after supper, at your desk ... although some messy but no more than a potato chip or even popcorn. Preheat the oven to 400F. Toss the edamame beans with the olive oil and kosher salt until well coated. Spread in a single layer on a baking sheet and roast for 15 minutes, tossing occasionally. Serve warm. Place the edamame beans in a microwave-safe bowl, cover with plastic wrap and cook on high power for 5 minutes. Let rest for 1 minute. Meanwhile, grind the salt and the tea leaves. Toss the mixture with the cooked edamame beans and the olive oil. Serve warm. Being Veg, I surprise myself more and more when I realize the things I haven't tried yet. Thanks for the info! I've heard much about them but have never done anything with them at home from scratch. I'm so excited about trying the olive oil one... but where can I find the edamame? Interesting take on the challenge Alanna, but seeing as one reader already commented on my blog that they prefer savoury over sweet at dessert time, I know your entry will have at least one major fan. I've become a bit obsessed with my little tin of Tea Chef lapsang souchong, and I have a bag of edamame in the freezer--I'll have to give this recipe a try asap.